Oh yes, finally I'm getting really started with my Hokkaido travelogue series! It might take a while for me to document my 10 days spent in Hokkaido, but I shall see this through! Well, the actual first day of the trip was spent on Thai Airways, so I shall fix the 2nd day as Day 1. And guess what? My shoes woes was back to haunt me! My lovely yellow boots (bought in Taiwan, yet again) decided to abandon its mission the minute I stepped onto Japan's land. Like, seriously. The sole dropped off even before I cleared customs. Thank goodness I'm fully aware of my "luck" with spoiling shoes on trips and I packed an extra pair. So... yup, a change of shoes right after collecting my luggage from the belt, and let's move on! And as mentioned in my prelude post, I've rented our car with Budget Car and has arranged to pick the car up at 930am. Which is why I gave up on this. 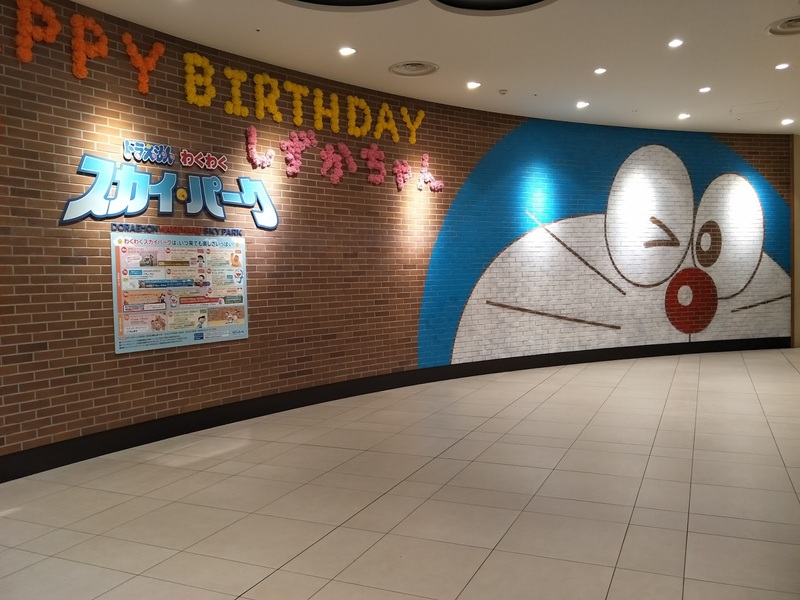 Stumbled upon Doraemon Cafe at Shin-Chitose airport while searching for the car rental booth, but they open only at 11am. Anyway it was Shizuka-chan's birthday back then! Anyway picking the car took a while, as we need to wait for their shuttle bus to pick us up from the airport and drive us over to the actual rental store, which is about 10 to 15 minutes drive away. 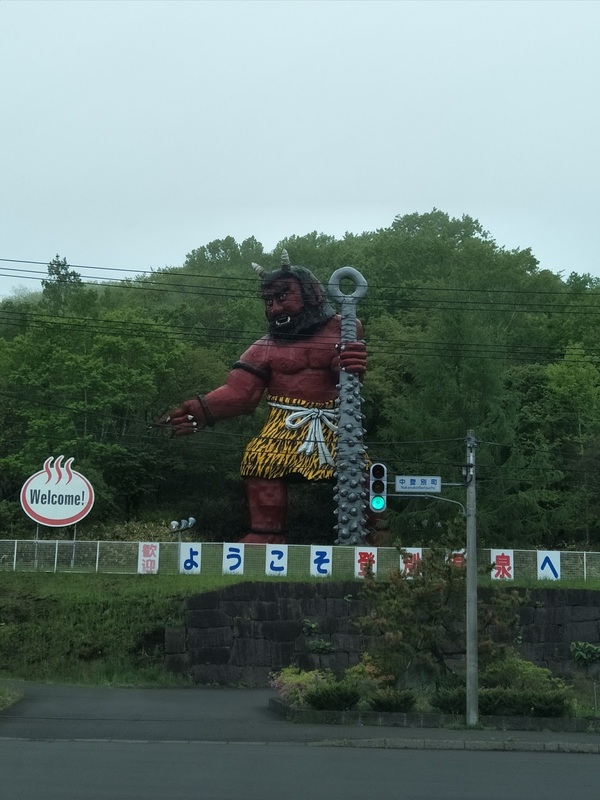 After which we spent another 30 to 45 minutes going through a short briefing from the staff and an introduction to our car (Toyota Passo) before really setting off for our first destination of the trip, Jigokudani (Hell Valley) at Noboribetsu! You'll know you're reaching Jigokudani when you see this big statue at the road junction. Jigokudani is a valley just above the town of Noboribetsu Onsen, displaying hot steam vents, sulfurous streams and other volcanic activity. It is a main source of Noboribetsu's hot spring waters. From the valley, there are a few walking trails that will lead you through the wooded hills above Noboribetsu. Following them will get you to Oyunuma, a sulfurous pond with a surface temperature of 50 degree Celsius and a smaller, even hotter, mud pond nearby. Following Oyunumagawa, the river flowing out of Oyunuma, for a few hundred metres will get you to a natural foot bath (ashiyu) along the way. 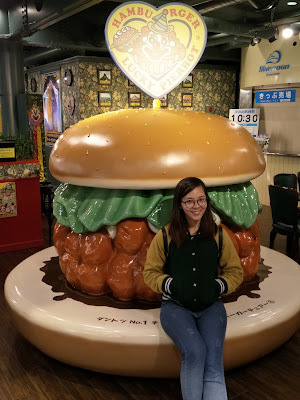 I was really pumped up for the walking trail and ashiyu at the end, but due to bad, rainy weather, we abandoned mission and headed down the street for lunch instead. Lunch place on the itinerary is Sobadokoro Fukuan! Even though soba doesn't top my list of favourite Japanese noodles (I even prefer udon over soba, to be honest), this soba place has earned pretty itself a pretty high ranking on tripadvisor and other travel sites, so I guess it's a must try! 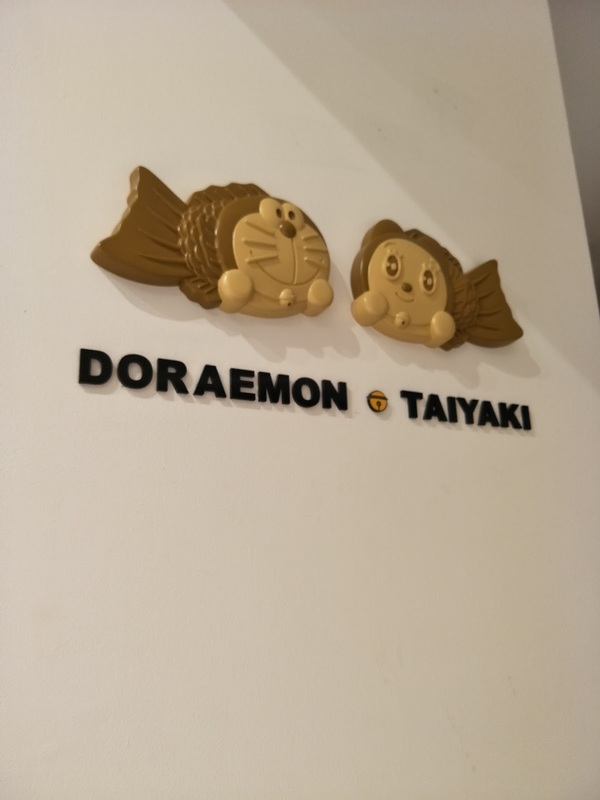 Moreover, the area is actually pretty quiet and there really isn't much choices of food anyway (there's a ramen-ya nearby too, if you'll prefer that). 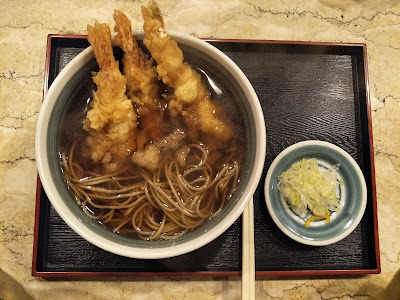 Now, this is definitely a good (and affordable) tempura soba! Though I would personally prefer the ebi tempura to be all soaked in the broth (and soggy), the prawns were still fresh and springy, and the batter half crispy. Well, literally half crispy because only half of the ebi tempura gets dipped into the broth so if you're quick enough, you can still get half of it crispy. The broth is flavourful and savoury, and complements the distinctive, subtle sweetness of the soba noodles very well. 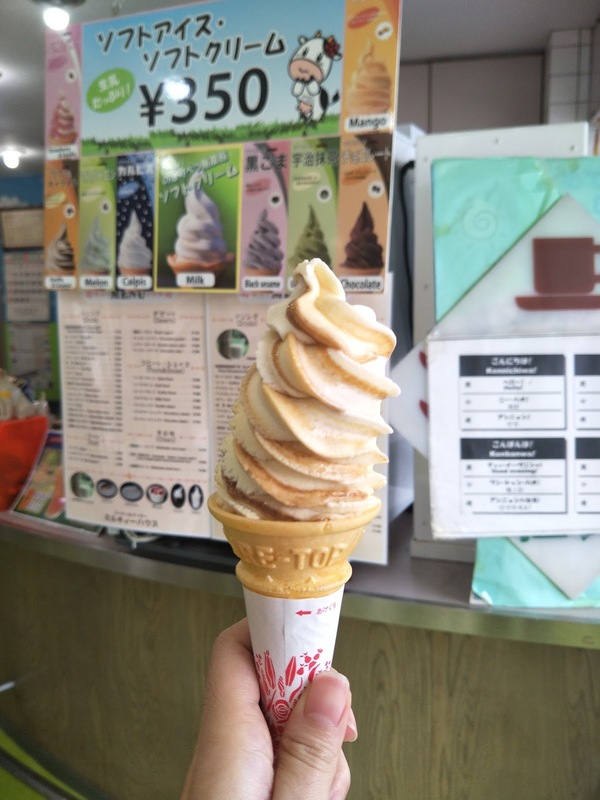 Chanced upon a Hokkaido Milk Soft Serve Shop on our way back to the carpark and picked up a caramel-hokkaido milk mix. SUPER YUMMY! And even after lunch (and soft serve), the rain just wouldn't ease up (and actually got slightly heavier) and so we gave up on the walking trail and ashiyu, and embarked on our 2.5 hours' drive down to Hakodate instead. 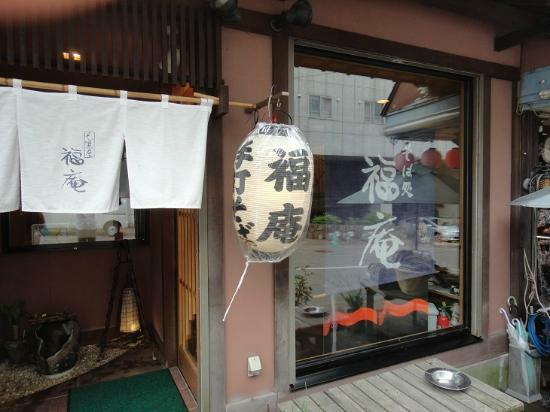 Pension Puppy Tail is a small, quaint hotel nestled at a 5 minute walk away from JR Hakodate Station. Decorated in a homely vintage style, it comes with either western or traditional Japanese rooms, and either ensuite or shared bathroom. There's also free wifi in the rooms and a free-to-use microwave in the lobby. And of course, I went for the western ensuite room that came well equipped with the basic necessities like toiletries (shiseido products), hair dryer, a mini fridge and a pretty small TV set. Bath towels, yukata (pyjamas) and comfy yukata jackets are also provided, so fear not if you do not do well with cold weathers. The hotel also provide free parking and is conveniently located next to a petrol kiosk (gas station) that closes by 9 or 10pm. 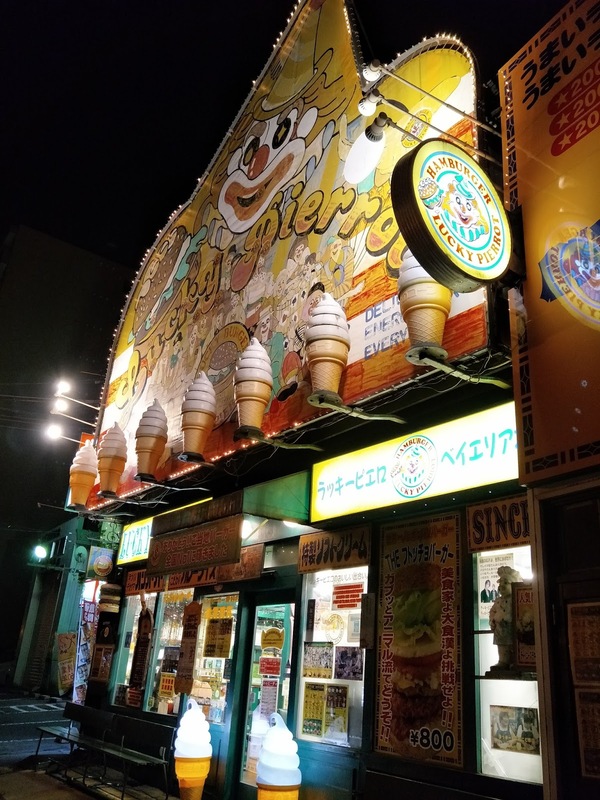 Other than being very near to the JR station, the Hakodate Morning Market is also easily accessible by foot (just perhaps another 3 to 5 minutes walk from the JR station). 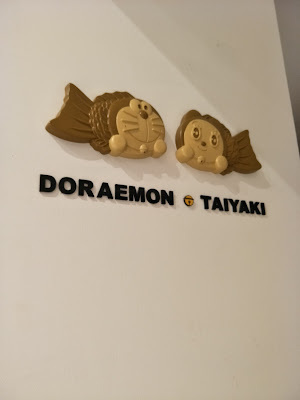 There are two owners (father and son?) manning the reception, and they're both really friendly and chatty. While I conversed with the younger male wholly in Japanese (hence I can't tell if he speaks good English), the elder male does speak decent, basic English. 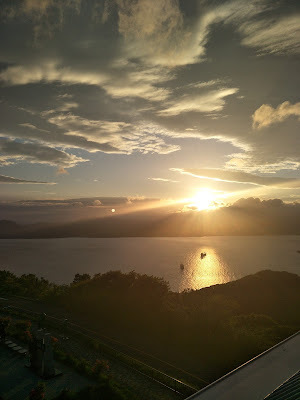 And shortly after settling down at the hotel, we set off for Hakodate Yama (Mount Hakodate) for sunset! 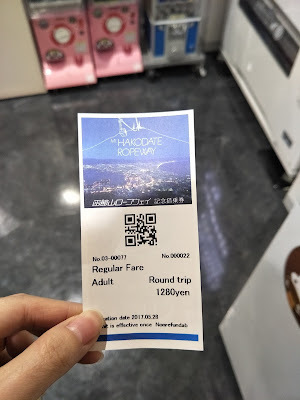 You may get to the observatory via a 3 minutes ride on the ropeway (cable car), bus, taxi, or self-drive. A round trip on the ropeway will cost you only 1280 Yen, which isn't that expensive. The observatory has an indoor viewing area (with a souvenir shop, a small snack shop and two restaurants/cafes) and an open air rooftop area for you to get an even better view. Even though we visited during the very end of May, it was still pretty cold (single digit Celsius temperature) with strong gusts of wind blowing at your from every single direction possible. And because it's so friggin' cold, the indoor seating area was packed and we had no choice but to brace the cold to wait for sunset. We were there at the rooftop at about 5 plus and loitered around for 1 hour plus before the sun finally set at about 630pm. 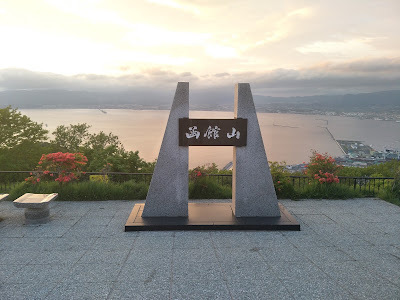 And if you want to snap a picture of the famous Mt Hakodate night view, you probably have to do it before the sun fully set because the best angle to take this shot will be "reserved" by the phototaking booth. They came around 630pm to start chasing visitors away and sending them up to the viewing stand on the other (higher) side, which won't be able to give you this head on, frontal shot. And of course, by hogging the best angle, they will charge you at quite a sky high price for a few shots. So shortly after the sun set, we headed back down to the indoor area and picked up a few hot & cold snacks. Only managed to snap a picture of just 1 out of the 4 snacks we bought, but I do highly recommend trying out their ice-creamy cheese tart (??). Sorry for being a superficial bimbo when it comes to snacks/desserts. 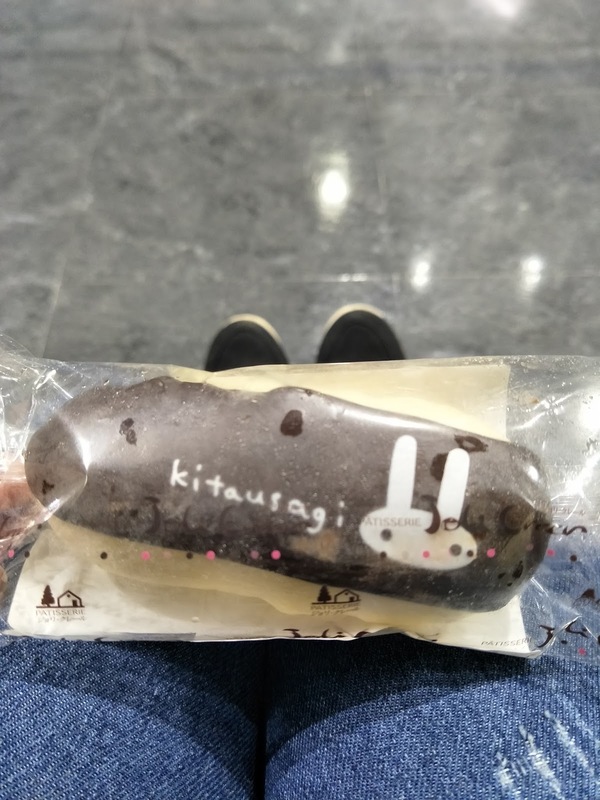 I chose to take a picture of this mediocre tasting ice cream puff with a cute bunny face on it instead of the true winner of taste (that cheesy tart) and so I cannot remember what is it called exactly. But it's sold at the chiller section (along with tons of other desserts) in the souvenir/gift shop, so do check it out! And after filling our empty stomachs with a little bit of food, we headed back up to the rooftop, intending to check out the night view and was stunned to find it packed to the brim with tourists. There was so many people, that it's impossible to see any kind of view. It's just countless back-of-someone's-head, really. So if you're bent on taking a beautiful, unblocked view of Mr Hakotdate's night view, I highly suggest you brace the cold wind and "reserve" your spot before the sun set at 5 plus, 6pm and just wait it out until the darkness sets in. And of course, we abandoned mission yet again and went off to find dinner instead. For more information on visiting Hakodate Yama, visit their website HERE. Dinner set on the itinerary was Lucky Pierrot, a fast food joint that's unique to Hakodate. So yeah, you can't find this anywhere else in Japan or even other parts of Hokkaido. ONLY HAKODATE! There's TONS of Lucky Pierrot branches in Hakodate. And with such a fanciful, near crazy shopfront, you can never miss it! 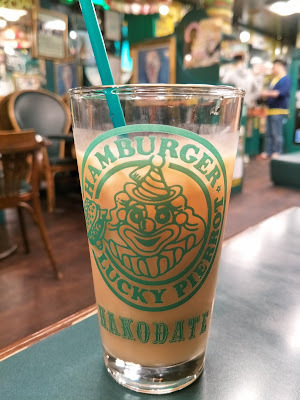 Love their clown logo, but not that much of the milk tea. It was pretty washed down. The BF decided to go with their Ninki No. 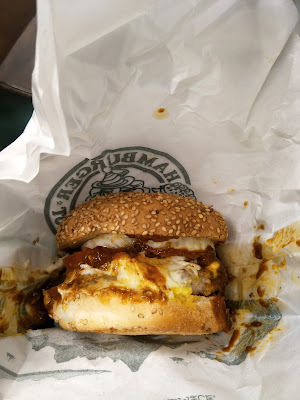 2 (2nd most popular choice), the Lucky Egg Burger, which is a hamburger (beef patty) topped with a fried egg. He can be quite a food snob at times and he totally food-orgasmed at first bite, mentioning that the sauce was fantastic. Best of all, this was only 390 Yen. No wonder we hardly see any McDonald's around Hakodate. How to fight, like that? I went for their Ninki No. 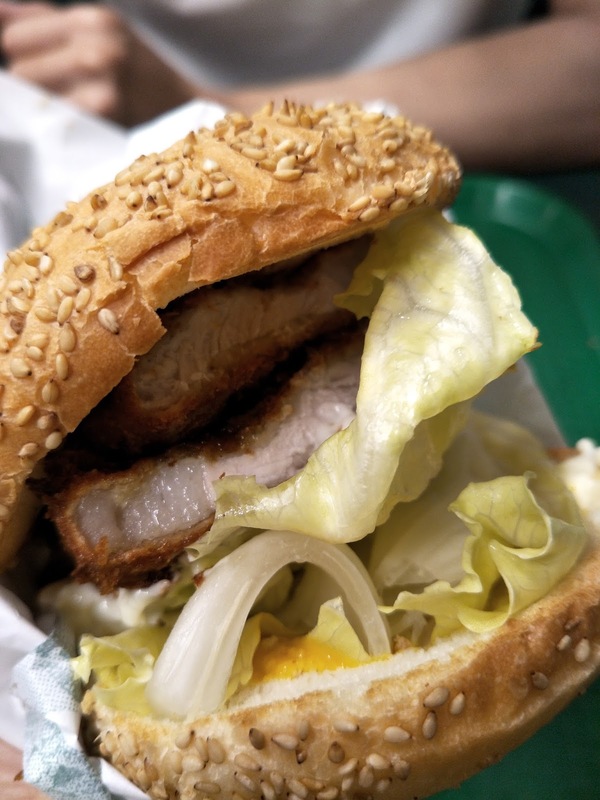 3, the Tonkatsu Burger that cost slightly cheaper at 380 Yen. The tonkatsu was super crispy on the outside and still quite tender on the inside. I only wished they've chosen a leaner cut of meat for me instead of this piece with a glorious, nearly 1.5cm wide, strip of pure FATS at the side. After a hearty (and fatty) dinner, we decided to take a stroll to the nearby (and very nearby, about 5 minutes walk) bay area and found yet another (and bigger) Lucky Pierrot. This bigger branch also sells some snacks, cooking condiments and other novelty stuff like hamburger shaped pouches and so on. 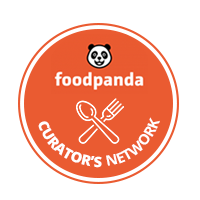 So do visit this branch instead if you'll prefer a fancier looking branch. And this marked the end of our Day 1 in Hokkaido! Day 2 is now up HERE so do check it out!